The new SCA Terminal was officially inaugurated during a reception on November 11th at the Port of Kiel’s Ostuferhafen. The Swedish concerns SCA (Svenska Cellulosa Aktiebolaget) and Iggesund Paperboard AB (Holmen Group) will use the new forest products and logistics centre to handle and store 850,000 tons of their high-value paper products a year which will be distributed throughout central and western European markets. The new SCA terminal was built inside a year on a site of more than 16 hectares in the northern part of the Ostuferhafen. A total of 25 million Euros were invested in it and 80 new jobs created, 60 of them in the Port of Kiel’s own handling company. The forest products centre comprises the No. 1 and No. 2 warehouses, both of 10,000 m² and now with new roofs and floors, as well as the new Number 5 Shed which, with its ground floor area of 18,000 m², is one of the biggest warehouses in the whole of Kiel. Also new is the 7,000 m² Shed 8, which is used for transport cassettes and was erected to give direct access to the ship berth and offer maximum weather protection during unloading. That offer is further complemented by the small Shed 4 and by a carriage shed, meaning that a total of more than 50,000 m² of hall space is available at the new SCA Terminal. 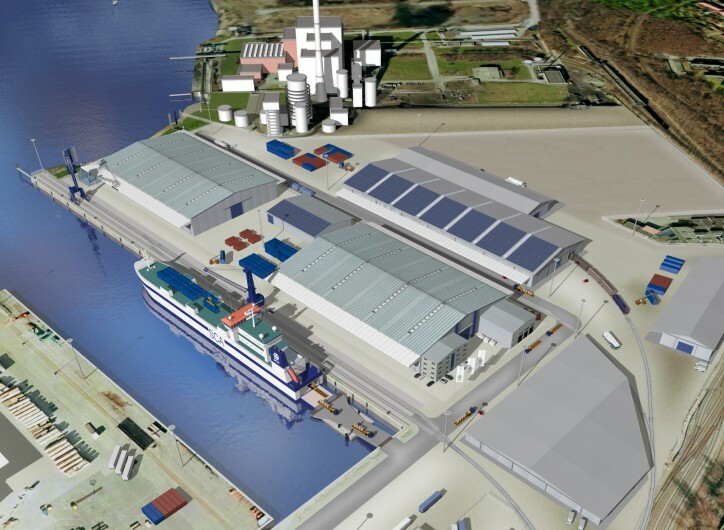 Large volumes of paper products were handled in the Ostuferhafen and in the Nordhafen already in the 1980s and 1990s so the inauguration now of the new SCA Terminal marks the return of paper to the Kiel Fiord. After the completion of an initial start-up phase, the SCA cargo ships Obbola, Ortviken and Östrand have been arriving in the Ostuferhafen from Sundsvall every Monday and Saturday in rotation since the start of October, to unload up to 160 cassettes of paper. The product palette ranges from cellulose materials and paper for printing to strong liner and cardboard boxes for high-quality packaging – destined for the German and European markets. In addition overseas containers are packed here for shipment via Hamburg to the Far East - Shanghai and Hong Kong. On their return trip to the Swedish east coast the SCA ships can carry different types of cargo, such as vehicles, breakbulk, steel or recycling materials. One important commodity in this connection is waste paper for which a special storage area has been created in the Ostuferhafen. The inauguration of the SCA Terminal has completed an important new step in the development of the Port Of Kiel. As a result of its new business, it has added warehouse manager and logistics partner to its already existing functions as a port operator and handling concern.